In a shallow bowl or pie plate, whisk together buttermilk and egg whites. Set aside. Spread mustard on one side of each slice of bread. Top 4 slices with 1 slice of cheese. Arrange ham on top of cheese. Add to each 3-4 thin slices of pickle. Top with remaining bread slices, mustard side down. Melt 1 tablespoon reduced-fat butter in a large nonstick pan over medium heat. Dip 2 sandwiches into buttermilk mixture; carefully flip and dip other side. Don’t soak the sandwiches in this mixture. Just lightly dip and remove sandwiches, allowing excess buttermilk mixture to drip back into dish. Add sandwiches to pan; cover and cook 3-5 minutes. Uncover, flip sandwiches, press top down with a spatula, cover and cook for 2-3 minutes until golden and cheese is melted. Remove sandwiches, place on a baking sheet and keep warm in oven. Repeat steps 4 and 5 with remaining 2 sandwiches. Slice each sandwich in half and serve with a fork and knife. We just love this quick to prepare dinner. 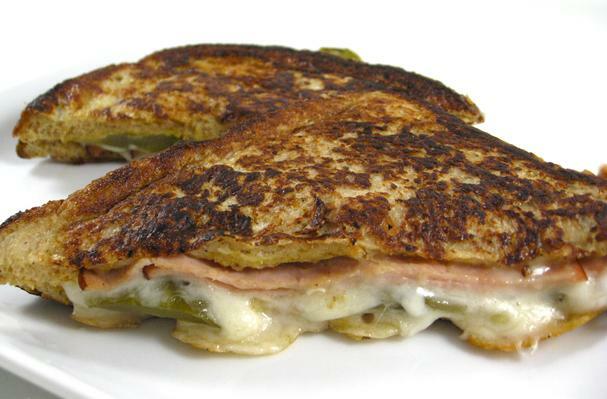 It’s not at all like a typical grilled ham and cheese. It’s very tasty with thin slices of dill pickle and mustard added, plus dipped into a buttermilk and egg batter before grilling. A French toast of sorts. It’s skinny due to using a fiber rich whole wheat bread, reduced-fat cheese, ham without nitrites and grilling in reduced-fat butter. One sandwich has 11 grams of fiber! Serve with a salad or cup of mixed berries. This sandwich is fantastic!